Stamp flower in lower right corner of white cardstock with black ink AND on a Post-it note (with part of the flower over the sticky end), Cut out flower on post-it note. Mask flower on white card by laying the post-it flower over the top. 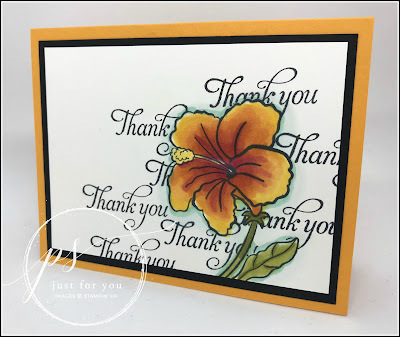 Stamp “Thank You” randomly over the top of flower and off the edge of white paper. Remove post-it note mask to reveal clean flower. Color flower with Stampin’ Blends: Light Mango for stamen, Cherry cobbler for center, blend in Pumpkin Pie toward edge and Mango on the outside of flower, with Old Olive leaves. Outline around the outside of flower with Light Pool Party Stampin’ Blend marker. Thanks for your comments, Sherrie! I really appreciate it. HAPPY STAMPING!